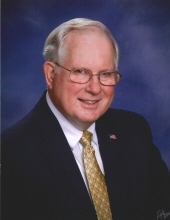 John Gordon Krider, longtime resident of Ponca City, Oklahoma passed away on Friday, March 22, 2019 at the age of 82. John was born in Ponca City on November 26, 1936 to Gordon and Oval (Butler) Krider. He attended Ponca City Public Schools and graduated from Ponca City High School in 1954. John attended Oklahoma State University. His career started at the Coca Cola Bottling Company. John went on to manage the Zales Jewelry Store in Ponca City for many years. After Zales he worked at Security Bank and Frontier Federal Savings and Loan/Heartland Federal until he left the banking industry to work for Trout Funeral Home. He remained an employee of Trout up until his death. John met his beloved Peggy in the fall of 1964 and they began a 53 year courtship. John and Peggy were married in Grace Episcopal Church in Muskogee on June 25, 1966. They had two children, John (Andy) in 1970 and Laura in 1971. John is survived by his son Andy and wife, Traci of Broken Arrow, Oklahoma, daughter Laura and husband, Jeff Martin of Oklahoma City, Oklahoma, two grandchildren, Devin and Hannah Martin, brother in law, Andy Anderson, and wife, Marty of Muskogee, Oklahoma, numerous cousins, nieces and nephews, and many, many friends. He was preceded in death by his dearly loved wife, Peggy Krider, parents, Gordon and Oval Krider, and sister, Patricia Chanslor. To send flowers or a remembrance gift to the family of John G. Krider, please visit our Tribute Store. Family would like to great friends at the funeral home from 6 p.m. to 8 p.m.
"Email Address" would like to share the life celebration of John G. Krider. Click on the "link" to go to share a favorite memory or leave a condolence message for the family.